Hi, Kelly here! 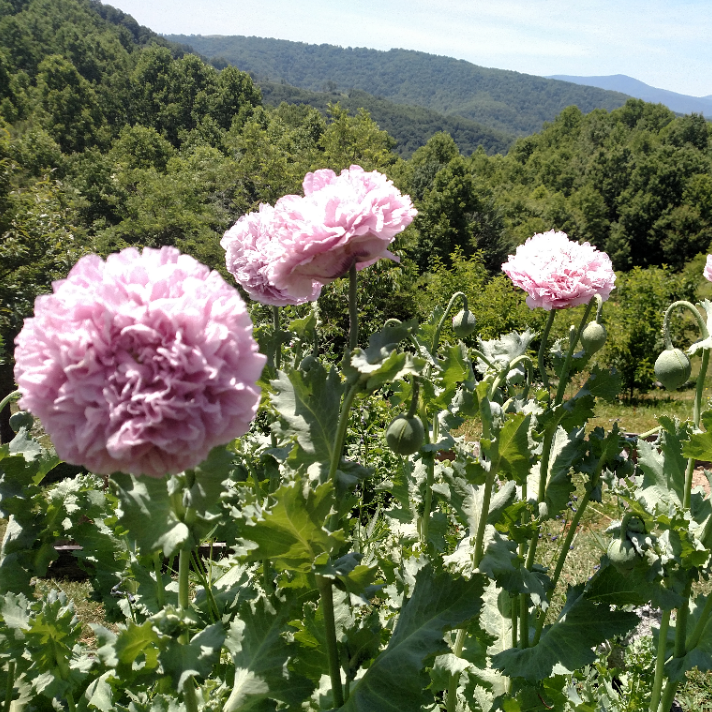 Today I'm sharing some favorite poppy varieties, grown by Lee from Goldenrod Gardens in Boone, NC! Lee and I love talking about flowers together. Last Spring she brought over fantastic poppies and I made an arrangement with them that I wish was captured by one of my photographer friends because it's one of my favorites and my images just don't do the flowers justice. Anyway, I'll pass it over to Lee and she'll share about the varieties! Comment with any questions you have about growing poppies! This potent beauty has captivated me with its (literally) intoxicating scent and ethereal flowers. Flowers last only three days, but if you cut them and split bud stage they will hold in a 39 degree cooler for up to a week. Multiple 4" double flowers in a cool lilac color atop 4' plants with pale green lettuce-like leaves. The seeds may be sowed outdoors in late fall (zones 6b-8) or early spring. I've done well starting in the greenhouse Jan-Feb and transplanting out in March. For me in zone 6b, their bloom period begins after the first week of June and continues through July, although temperatures above 80 produce inferior flowers and stalks. Their pods are nicely sized-1" and stems curve gracefully and make interesting dried subjects. Annual. Woah, Nellie this is a poppy with presence! 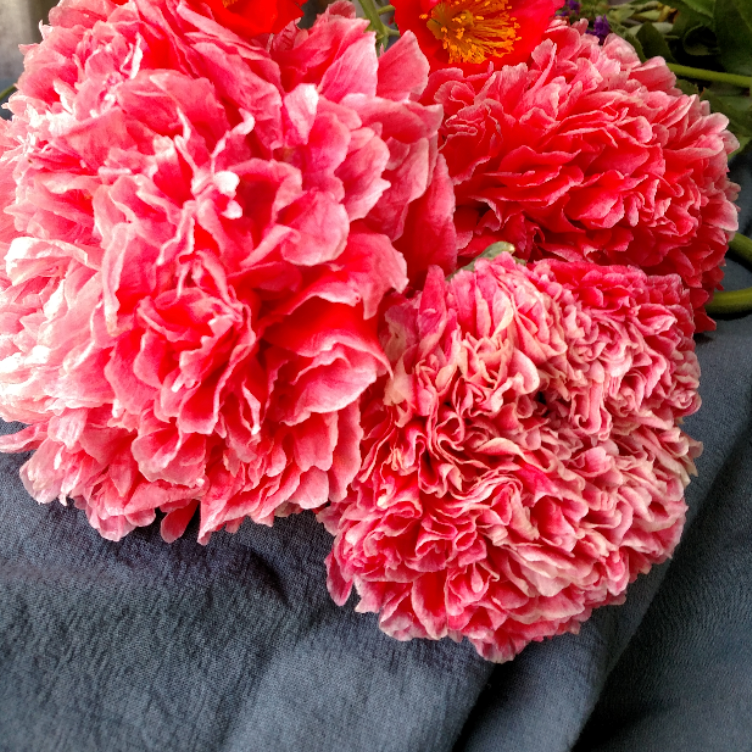 Extremely plump, double flowers are the most amazing color of rich salmon. They definitely remind me of peonies but the saturation of color and density of their blooms is incomparable. Their stems curl so they need creative placement in floral work. Culture, harvest and vase life are similar to the 'Lilac Candy Floss' although they do not bloom as long. Annual. These sweet heirloom poppies remind me of butterflies the way they hover in the garden. 2" Single flowers are finely colored in shades of white, peach, red and purple often with a fine overlay of color giving them and iridescent quality. Individual flowers last about 2 days but cut stems with multiple stalks will continue for days (I've even had this happen in a bucket full of them out of water) Cut when the buds begin to point up and you can see the color through the calyx or at split stage. Hold in a cooler at 39 degrees up to 5 days. They are easy to grow and will self sow in surprising places after established. Culture same as above. Annual.